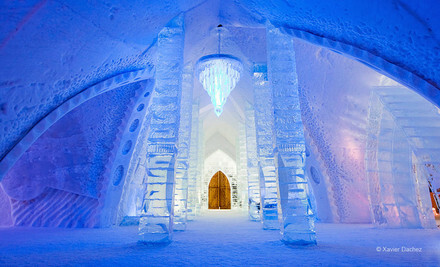 Just north of Quebec City, Hôtel de Glace stands amid snow-covered hills like an icy citadel in a fairy tale. 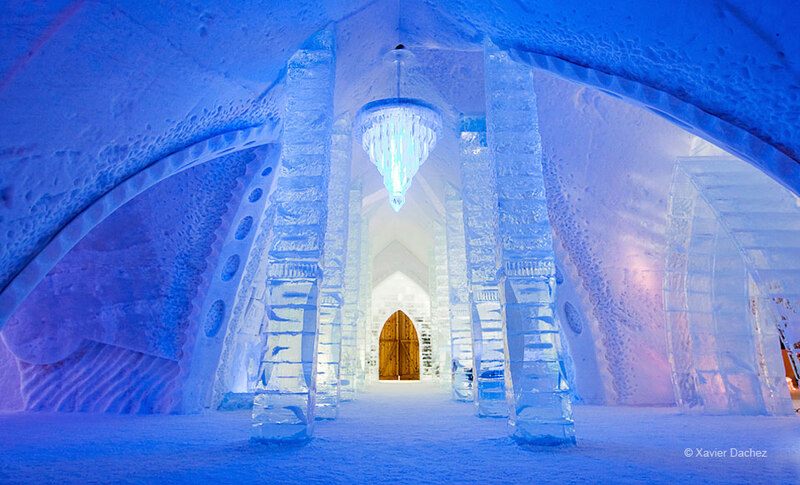 The hotel’s domes and columns have been molded from 500 tons of ice and 15,000 tons of snow—the same materials used to carve the interior’s sparkling chandeliers and one-of-a-kind sculptures. The structure is as intricate as a snowflake and as ephemeral: the hotel closes its doors by late March, and by the time summer rolls around, the frozen palace has completely melted away. Upon arrival, you can sip welcome cocktails at the gleaming ice bar before taking a ride down a giant slide (also made of ice, of course). To warm up, head outside to the Nordic spa’s hot tubs and sauna, which stay open from 9 p.m. until 9 a.m. From noon to 5:30 p.m., guided tours unveil intricacies of the hotel’s construction. Ice-walled standard guest rooms have beds made from thick slabs of ice topped with wooden slats, a mattress, and Nordic sleeping bags certified for sub-arctic temperatures to help keep you warm and dry. As sunrise transforms the hotel’s exterior into a shell of glittering crystals, the Celsius Pavilion’s restaurant serves a piping-hot American breakfast. Just to the south of Charlesbourg, the walled district of Old Quebec, a UNESCO World Heritage site, features cobblestone streets and examples of 17th-century colonial architecture within its defensive ramparts. Be sure to visit the neoclassical Notre-Dame de Quebec to see its soaring nave adorned with gold molding. After happening upon the Niagara Falls in 1678, Franciscan missionary Louis Hennepin wrote in his journal that the iconic destination was a “prodigious Cadence of Water which falls down after a surpizing and astonishing manner, insomuch that the Universe does not afford its Parallel.” Over the past 300 years, the Falls have inspired more than just awed journal entries. As many as eight million visitors a year come to the cascades, from poncho-clad honeymooners to daredevils who have taken the 175-foot plunge inside wooden barrels or rubber balls. Sheraton at the Falls is conveniently located just a mile east of Niagara Falls, within easy walking distance of several attractions on the American side. Directly across from the hotel is the Seneca Niagara Casino, which stays open 24 hours a day. Seneca Niagara’s stained-glass windows and neon lights from more than 4,200 slot machines set the casino aglow. Here, colorful card tables host rounds of blackjack, craps, roulette, and musical chairs. A more soothing atmosphere washes over the casino’s spa, which offers body-healing therapies, massages, and salon services. Sheraton at the Falls focuses on comfort in its spacious guest rooms: plush custom mattresses bolster the Sheraton’s signature Sweet Sleeper beds, layered with assortments of feather and down pillows. With this Groupon, you get a $20 credit to the first-floor T.G.I. Friday’s, which serves 10-ounce sirloin steaks, Black Angus burgers, and other hearty American fare. While you’re here, feel free to take a dip in the indoor swimming pool or grab a morning cup of joe at the Starbucks in the lobby. Encompassing more than 400 acres, Niagara Falls State Park functions as a natural border between Canada and the United States. Scenic vantage points can be found on both sides of the border and its falls, where more than a million bathtubs’ worth of water cascades down every second. Pedestrian bridges and observation decks provide safe vistas for you to watch the Horseshoe Falls and American Falls spill over jagged cliffs. The most invigorating view might be from the Hurricane deck—a wooden platform located 20 feet from Bridal Veil Falls. Access the platform by taking the Cave of the Winds tour, during which professional guides lead poncho-clad visitors to Bridal Veil Falls via wooden pathways. One-night stay for two in a king or double queen room. Up to three kids stay free. Combine up to three Groupons to extend your stay. 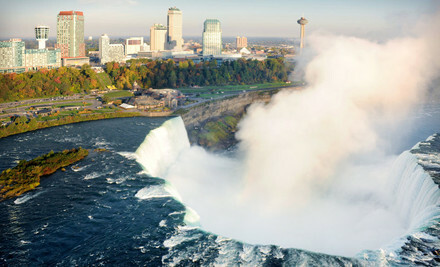 Four Points by Sheraton Niagara Falls Fallsview Hotel sits within easy walking distance of one of North America’s natural wonders, the roaring Horseshoe Falls. The hotel is also plugged directly into the area’s manmade attractions, thanks to an indoor walkway connecting to Fallsview Casino. More than 150 gaming tables, 3,000 slots, and scores of video-poker machines fill the neon-lit tower, which also houses a stage where A-list performers such as Jay Leno and Kelly Clarkson have performed. High above all the glitz, rooms at the hotel offer unobstructed views of Horseshoe Falls and the city of Niagara Falls. For a closer look, hop onto a complimentary shuttle, which makes regular stops at the falls. Just steps from the hotel, The Keg Steakhouse & Bar boasts stunning views from its ninth-floor perch at Embassy Suites. The eatery serves juicy prime rib and sirloin tenderized to perfection by the Toronto Blue Jays’ cleanup hitter. Niagara Falls has plenty of Vegas-style kitsch in the form of glitzy casinos, flashing neon signs, and soggy Elvis impersonators. But the star attraction remains the waterfalls, which send more than 700,000 gallons of water into the Niagara River each second. The Canadian side of Niagara is the best place to admire American, Bridal Veil, and Horseshoe Falls. The iconic Maid of the Mist boat tours run April–October, but the Journey Behind the Falls attraction stays open year-round. Elevators descend through bedrock, leading to tunnels and observation decks just steps from the cascades. Niagara’s Fury—a recent addition—takes guests on a 3-D multisensory ride detailing the site’s origins. Sign up for the Travel Alberts newsletter and receive travel deals. In 1953, Marilyn Monroe was given top billing for the first time in a major motion picture. The movie was Niagara, and it not only helped propel Marilyn to stardom, but it legitimized Niagara Falls’ place in pop culture as a classic getaway. 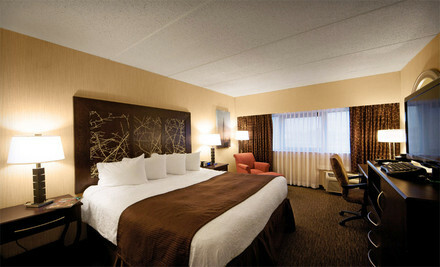 About a 10-minute walk from the famous cascade you’ll find Courtyard by Marriott Niagara Falls. The hotel is also just a short walk away from the bright lights of the entertainment district. Each spacious standard or king whirlpool room is decorated with chic but simple furnishings, including crisp white linens with red accents and dark wood furniture, that don’t distract from the view of the surrounding town below. You can redeem the $20 dining credit included with this Groupon at T.G.I. Fridays, located next door to the hotel. It serves up crowd pleasers such as Jack Daniel’s–glazed ribs and tomato-basil chicken pasta. In the morning, you can hit up the hotel’s full, hot breakfast buffet and try to re-create the falls by pouring coffee over stacks of toast. This deal also includes shuttle passes for rides to the casinos and attractions; you can hop into the shuttle for a quick ride to check out the amusements in downtown Niagara. North of New York and right along the United States–Canada border, Niagara Falls is one of the unofficial wonders of the world. It’s often called “the honeymoon capital of the world,” too, as lovebirds often stop by here to stand next to the majestic scenery. For an attraction that is time-tested and president-approved, take a ride on the Maid of the Mist, an open-top cruise ship. It’s been in operation since 1885, and Theodore Roosevelt, Marilyn Monroe, the Prince and Princess of Wales, and Angelina Jolie have all taken the tour, which has gorgeous views of the falls. The ride edges so close to the falls that passengers often get sprayed by the thick mist, so raincoats are handed out beforehand to protect your clothing. A 10-minute walk from the falls, you’ll see the neon glow of the Clifton Hills neighborhood. Stroll through here to find some kitsch-themed restaurants, souvenir stands, and blinking casinos. One-night stay for two, valid Sunday–Thursday. Up to three guests 12 or younger stay free. 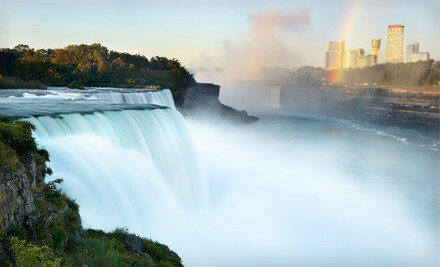 On average, 4 million cubic feet of water will plummet 165 feet down Niagara Falls into the Niagara River every minute. The show of force doesn’t stop when it hits the river, either. Just a few miles downstream, a hydropower facility transmutes the massive flow of water into 2.4 kilowatts of power—making the falls the biggest producer of electricity in the state of New York. The Adam’s Mark Buffalo hotel is located about 20 minutes away from the falls. Though it’s not surrounded by an otherworldly cloud of mist, the hotel is grandiose in its own right. Mirrored columns and tiered chandeliers line the lobby, which is decked out in marble. A meeting space in the hotel spans 72,000 square feet, and the Seneca Allegany Casino features 68,000 square feet of gaming such as blackjack, craps, or high-limit slot machines. On the first floor of the hotel, Deco Restaurant serves gourmet plates such as sichuan barbecue salmon ($25) and coq a l’orange ($24) alongside fine wines under the glow of marquis lights. In the morning, guests can file in for a breakfast-buffet spread. Next door, a glass roof covers the Tiffany Rose lounge, which is decked out with model sailboats. Buffalo is located in western New York and across the border from Ontario, Canada, right at the confluence of Lake Erie and the Niagara River. In 1825, the Erie Canal connected the lakefront town to important shipping ports along the eastern seaboard, transforming it into a flourishing commercial center almost overnight. During the boom period, the city’s wealthy residents began commissioning architects such as Frank Lloyd Wright and Louis Sullivan for lavish building projects. In turn, the city has an eclectic collection of 19th-century architecture. On a walk through downtown, you can see the colorful tiled dome of the art-deco-style city hall. About 1.4 miles north is Millionaires’ Row, which is lined with palatial stone mansions. In 2010, Forbes named Buffalo one of the best places in the country to raise a family, thanks in part to its sprawling park system and wealth of hide-and-seek spots. Designed by Frederick Law Olmsted, Delaware Park features 350 acres of open space flecked with scenic walkways and landscaped gardens. During the summer, crowds gather here to play frisbee, set up picnics, and watch Shakespeare plays. At Niagara Falls, one of the seven natural wonders, water thunders over the edge at a height of nearly 200 feet and crashes onto craggy boulders below. The falls straddle the border between Canada and the United States, with segments located in both New York and Ontario, but the Canadian side of the Niagara River is universally hailed as the finest vantage point to take in views of photogenic spots such as American, Bridal Veil, and Horseshoe Falls. The AAA Four Diamond Marriott Gateway on the Falls features a terrace, an observation deck, and 32 stories of picture windows overlooking the majestic rushing waters of Niagara Falls. Floor-to-ceiling windows also provide vistas of the cascades at the onsite Milestones Grill + Bar on the mezzanine level. Here, guests dine on breakfast, lunch, and dinner entrees including wild Pacific coho salmon ($22.99) and grilled mediterranean chicken ($17.99); two domestic beers, glasses of house wine, or highball drinks are also included with the Getaway. After taking a swim in the indoor pool or training to deliver medicine balls to needy bodybuilders in the fitness center, guests can retire to Cityview rooms, which overlook the city of Niagara Falls. Fallsview rooms provide a close-up peek of the Canadian Horseshoe Falls and American Falls. 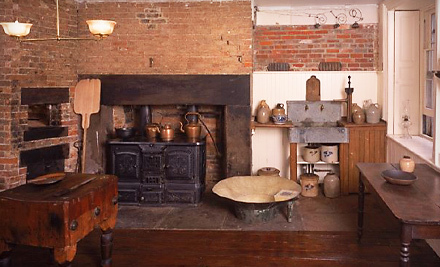 Vacationers first began filing in droves to Niagara Falls in the antebellum era, and the destination later became popular for honeymooners in the mid 20th century. In 1885, the New York State Legislature created the Niagara Reservation to protect and preserve the falls, which were at risk of being overrun by commercial development. Today, the tourism industry remains the vital lifeline of the town, and though the falls themselves may be protected from commercial enterprise, the surrounding area is fair game. On the Canadian side, along Fallsview Boulevard, casinos, indoor water parks, restaurants, and shops have sprung up, catering to the influx of visitors from all over the world who come to admire the falls’ astounding beauty and the eminent mist that doubles as makeup remover. For travelers who want to feel the spray, the iconic Maid of the Mist has ferried raincoat-clad passengers around the base of the falls since 1846. The tours begin running in early April, depending on the river’s ice conditions. Year-round, Journey Behind the Falls grants a glimpse behind the curtain of Horseshoe Falls. After boarding an elevator, visitors descend through the bedrock and are dropped off at observation decks steps away from the cascading water. Forests stretch for miles around Kawartha Lakes, creating a tranquil atmosphere. The region seems to gather even more composure in the wintertime, when the lakes freeze over and evergreens stand motionless beneath blankets of snow. Situated along the shores of Lower Buckhorn Lake in the heart of Kawartha Lakes, Westwind Inn on the Lake fits in seamlessly amid its quiet, woodland surroundings. The 60-acre Westwind estate fronts more than a quarter mile of shoreline, surrounded by thousands of acres of pristine forests and gardens. During the winter, snowshoers and cross-country skiers traverse track-set trails, and ice skaters on the frozen lake practice Kristi Yamaguchi’s short program from the 1990 Worlds. After a day spent tromping through the snowy wilds, guests can warm up beside one of Westwind’s outdoor fire pits. Garden-view rooms in the lakeside Main Lodge are decked out with cedar-planked walls, a fireplace, and toasty quilted bedding. 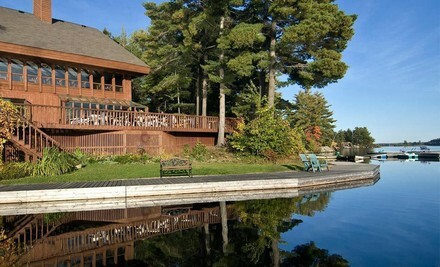 The log-cabin-style accommodations come with private balconies overlooking the manicured grounds. In the similarly furnished Treetops Dining Room, chefs prepare complimentary continental breakfasts and country fare such as a pan-seared pickerel fillet. Located about a two-hour drive northeast of Toronto, Buckhorn offers plenty of culture. Next door to Westwind Inn on the Lake, the Gallery on the Lake showcases one of Canada’s largest privately owned collections of sculptures, carvings, and paintings. About 21 miles (34 km) from the hotel, the town of Peterborough boasts a lively art scene with a contemporary dance center, a symphony orchestra, and paint-by-number billboards. When the Crofton family opened their farmhouse situated along the Ganges Harbour to travelers in the early 1900s, there was no regular ferry service to bring food to Salt Springs Island, meaning they had to rely on their own farmland to feed guests. Nearly a century later, Harbour House Hotel is still primarily self-sufficient. Beehives supply honey, and gardens and greenhouses yield more than 100 fruits, grains, and vegetables, from carrots to quinoa. Homegrown produce also supplies the hotel’s onsite restaurant, which earned the honor of Best Brunch in Canada from Food Day Canada in 2011. On a complimentary tour, the farm staff guides visitors through bigleaf-maple orchards and into the greenhouses, occasionally plucking fresh samples from the ground. This deal includes a brunch or breakfast for two at the hotel’s restaurant, where a chef curates a menu with candied salmon benedict ($14) and maple quinoa pudding ($8) made from house-harvested maple syrup, boiled in one of British Columbia’s first evaporators. Inside many of the hotel’s wood-furnished standard rooms, guests can peer onto the lush grounds where the farm’s goats roam and play Balderdash. 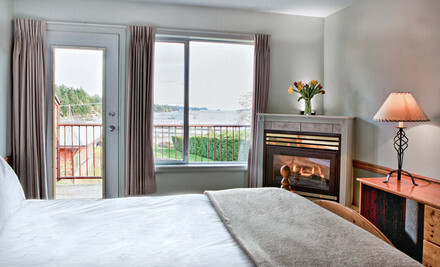 In the Harbour View room, a balcony overlooks the Ganges Harbour while a gas fireplace in select rooms warms the room on winter nights. Located on Salt Springs Island, off the southern coast of British Columbia, Ganges Village brims with craft studios, where artists present glassblowing projects, handcraft pottery, and whittle wood. This creative community purveys handmade candles and jewelry for local boutiques. The annual Salt Spring Farmers Market runs every Saturday starting in April, when Centennial Park comes alive with improvised music, dancing, and goods from local farmers. With 81 miles (130 km) of shoreline, Salt Springs Island provides plenty of spots for kayaking, biking, diving, and boating. Off the coast of Ruckle Provincial Park, scuba divers frequently find octopi, starfish, and giant barnacles, while avian lovers spot eagles, quail, and antelopes with fake wings and beaks. Niagara Falls flows along the border of both New York and Canada, and it’s essentially consensus that Canada has the best panoramic view of the cascades. But where the Canadian side features fun houses, high-rise hotels, and sprawling commercial sites, Niagara Falls, New York taps more into the roughhewn wilderness of the area. The rapids’ sense of raw power is also readily apparent in the winter, when attractions close, ice bridges form over the Niagara River, and chills crystallize the surging mist onto the surfaces of trees and railings. Situated right along the river, Four Points by Sheraton Niagara Falls sits about 5 miles east of Niagara Falls State Park. After one explores the natural wonderland, the hotel acts as a cozy home base: there’s a fireplace in the lounge, and the heated pool is housed in a glass atrium overlooking the river. Upon arrival, visitors can sit down with a bottle of wine and appetizer at the onsite Bella Vista Ristorante. The Italian eatery’s menu—crafted by celebrated chef Cory Linkson—features hand-rolled pastas and homemade pizzas. All the wines hail from CK Mondavi—a third-generation family winery that uses cold fermentation and sterile filtration techniques to create bold, crisp varietals. Meals can be enjoyed on a seasonal patio overlooking Niagara River, or in a casual dining room, where diners can catch sports on large flat-screen TVs or make their own milkshakes by roasting a scoop of ice cream over the flickering fireplace. The oldest state park in the United States, Niagara Falls State Park has had its rustic beauty preserved partially by resisting over-commercialization. Many of the nearby attractions help to heighten appreciation of the natural majesty, including an observation tower that extends over the river gorge and an aquarium hosting more than 1,500 marine animals from both local and nonnative ecosystems. Nearly 15 miles of hiking trails wend through the park, and along the way, visitors can learn about the area’s history at the Discovery and visitors centers or by reading informational panels that pop up along the trails. 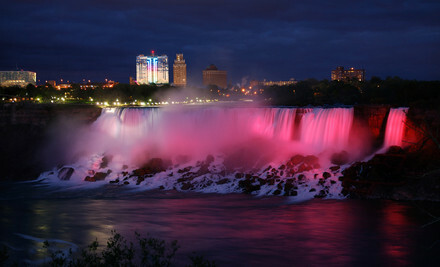 In addition to open-air pursuits, Niagara Falls boasts an assortment of fine-dining restaurants, shops, and casinos. Included in the package, guests receive a $30 voucher for slot play at Seneca Niagara Casino. More than 4,200 reel-spinning and video slot machines are sprawled out across the game room, with many machines linked to a progressive jackpot that increases after each round concludes or when a craps player rolls a 3 with oversize fuzzy dice. The Seneca Indian–operated casino also features more than 100 table games, including blackjack and three variations of poker, as well as an events center with live music shows. Evoking the mirage of an oasis in the desert, a citadel of ice rises from the snowy knolls north of Quebec City. Peaks, domes, and columns molded from 500 tons of ice and 15,000 tons of snow form an arctic castle with sparkling ice chandeliers and carved snow sculptures. The magnificent structure of the Hôtel de Glace is as intricate as a snowflake, yet also as ephemeral: by late March, the hotel closes its doors, and as spring announces the annual thaw, the frozen palace melts and vanishes. Upon arrival, snowbound sojourners can sip welcome cocktails from custom carved ice blocks at the polished surface of the ice bar. Furnishings fashioned from monumental blocks of ice glimmer with kaleidoscopic hues as inset lighting colors it from within, and the glistening surface of the grand slide nearby suggests gleeful careening. Guided tours from noon to 5:30 p.m. reveal intricacies of the hotel’s construction, such as the secret method of conniving Iceman to freeze unsuspecting credenzas. Outside, the Nordic Spa’s hot tubs and sauna allow frames to soak in concentrated warmth as they send plumes of steam wafting toward the stars from 9 p.m. until 9 a.m.
After a training session on winter camping techniques, visitors enter standard guest rooms, which house ice-slab beds inside snow walls. Atop the frozen pedestal, wooden slats, a mattress, and Nordic sleeping bags certified for sub-arctic temperatures keep frames warm and dry. As sunrise transforms the hotel’s exterior into a shell of glittering crystals, the Celsius Pavilion’s restaurant caps the fantastical adventure with an American breakfast. Minutes to the south, the walled city of Old Quebec, a UNESCO World Heritage site, shelters cobbled streets, 17th-century colonial architecture, and specters of once-fashionable ruffles within its defensive ramparts. There, the neoclassical façade of Basilica-Cathedral Notre-Dame hides a soaring nave overflowing with gold molding. For $5, you get one general-admission ticket (a $10 value). For $9, you get two general-admissions tickets (a $20 value). For $16, you get four general-admissions tickets (a $40 value). Visit International Way, a cultural tour from more than a dozen countries. Sample 92Y programs in art, music, film, fitness and more. Participate in children’s arts & crafts, sports, concerts and games. Enter raffles for free trips, classes, tickets and other prizes. Support local farmers and shop sustainably at our Greenmarket. Share Your Story on Facebook via on-site video. Enjoy fitness demonstrations, free health screenings and KidSports and games. Tour our world-class gym: 92Y May Center for Health, Fitness & Sport. Special offers throughout the day! $29 for Five Drop-In Yoga-Class Package at Jivamukti Yoga School ($100 Value). $49 for 10 Drop-In Yoga-Class Package ($200 Value).